Custom orders placed today will be ready to ship in approximately 2 weeks. If you need something sooner please send me a message and I will let you know if that is possible. 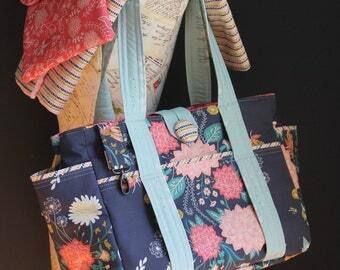 All of my digital patterns are PDF files which will be delivered via instant download to your Etsy account. Please let me know if you need any help with the download process. The camera strap cover was just exactly like I ordered, was shipped super fast and was easy to slip on to the camera strap. Once put around my neck I could feel the cushioning and it makes a HUGE difference on the comfort of the camera. 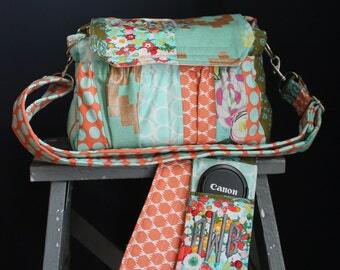 The patchwork camera bags are unique as I stitch together several smaller bits of fabric to create larger one of a kind fabric panels. 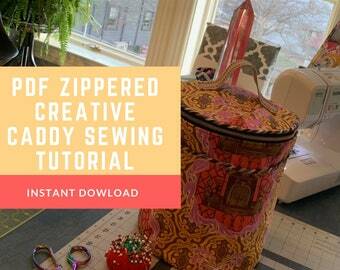 This is a creative process which ultimately results in a wearable work of art. Hello! My name is Andrea and I am so glad you are here and want to thank you for your interest in my designs. I work in a sweet & sunny Main Street studio situated in Northern Virginia, approximately 25 miles from Washington, DC. It's a colorful creative world! Thoughtfully designed and expertly crafted, an enormous amount of attention goes into every one of my designs. Your satisfaction is the highest priority. If for any reason you are not pleased with your purchase, you may return it, in perfect condition, for a refund. Monogrammed orders are unique and can not be returned or exchanged. Returned items must be in new condition and returned within 14 days of receipt. Shipping fees are not refundable and no refunds or exchanges will be issued after an item has been used. Digital downloads and online courses are subject to the terms outlined in the listing description. Etsy direct checkout and Paypal are the preferred methods of payment. Every item is custom made to order. A reminder for international customers: Import duties, taxes and charges are not included in the item price or the shipping charges. These charges are the buyer’s responsibility. Please check with your local customs authority to determine these additional costs prior to buying. I am unable to mark merchandise values below retail value or mark parcels as “gifts” --- U.S. and international government regulations prohibit such practices. All international sales are final --- no refunds or exchanges can be made. All of the products listed in my shop are my original designs and finely crafted in my quaint commercial studio. You may also reach me via phone/text 703-577-0283.